Groups have long used disparaging humor to differentiate themselves from other groups, establish boundaries, and enjoy “vicarious superiority.” Memetic disparagement, however, is possibly a more powerful form of disparagement because of the low cost, speed of distribution, and lack of attribution, but more importantly because memes’ inherent sharedness—the genre is built on inside jokes and differentiation, creating an even more disparaging statement. 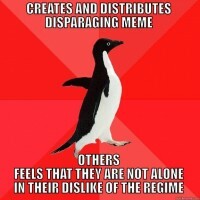 Others have argued that memes afford collective identity building and maintenance through contributing to group norm formation, this essay specifically considers disparagement as a group identity differentiation tool, using the case of the Azerbaijani opposition disparaging the ruling regime through memes. This is a particularly interesting case because of the great risk and severe consequences involved in memetic dissent in an authoritarian regime. In disparaging humor, the target of the joke is denigrated, belittled, or treated aggressively (There is a ton of great research on this—these two pieces are a good start if you’re interested.). Disparaging humor is often thought to be used by a group to demonstrate superiority over another group. Social identity and self-categorization theories tells us that groups differentiate themselves from other groups in ways that are advantageous for their own group and this may include discriminating against or disparaging other groups in order to enhance a group’s own self image. Acts of differentiation can manifest as bullying, harassment, or violence and disparaging humor. Disparaging humor can both increase morale and solidify the in-group and foster a hostile disposition toward the out-group. Memes are perhaps even more powerful than other means of differentiation or disparagement first because memes differ from traditional disparaging humor because of the difference in speed, cost, and attribution. But most importantly, memes are more powerful than other means of differentiation because, as Limor Shifman argues, memes embody sharedness through variation. Memes originate with a shared idea, content, form, and/or stance, but are transformed into variations of the original and one must comprehend both the original form and the variation in order to be “in on the joke.” This shared understanding of the meaning, requires an implied “other” whom do not understand the meaning. Those that “do not get” the meme become a reference group for the in-group to differentiate itself from, and via disparagement, allows the group to demonstrate its superiority. Memes’ sharedness become a powerful performative act of both group identification and differentiation. While all humor relies upon shared norms and ideas, memes “inside joke” quality, or are group “lingua franca” (both attributed to Ryan Milner) require also maintaining an understanding of the variations. Additionally, memes’ affordance of new variations on a shared social phenomenon creates unpredictability. While unpredictability does not impact all group differentiation goals, in this case study of an authoritarian regime, sharedness and unpredictability is essential. Unpredictability and instability are the kryptonite of authoritarian regimes . Unpredictable memes reorder what is visibility in a closed regime by highlighting the unspeakable , often through sidestepping the mechanics of censorship (Mina, 2014) or social control. Thus memes that disparage the ruling regime go beyond group differentiation and are viewed as a direct threat to the regime. Azerbaijan is an authoritarian state with well-documented suppression of political opposition and civil liberties, especially online. Online spaces are more unpredictable and threatening to the ruling regime than traditional venues of dissent. Heavy suppression leads to creative means of dissent, and one of the few, yet commonly used tools that oppositionists in authoritarian states have is humor. Social movements, including dissenters, like any other kind of group, also use humor to differentiate themselves. Humor generates a sense of common identity and fosters solidarity, defining the group while also integrating new members. Kutz-Flamenbaum calls this “internal humor” where collective identity is maintained, strengthened, and grown in a social movement community. This is opposed to “external humor,” humor used as a tactic or a frame directed at an audience outside of the social movement. Recent scholarship shows that memes are being used in repressive environments to spread political content and criticism to a wide, sometimes politically disinterested, audience. In June 2015, Azerbaijan hosted the first European Games, an Olympic qualifying event for many sports, at an alleged cost of over 8 billion USD. Some Azerbaijanis were upset about this venture, especially in light of the drop in oil prices and subsequent devaluation of the local currency by a third in January 2015. Many international observers considered the Games as a costly promotional opportunity for Azerbaijan, but despite the regime’s best efforts, the event was a publicity disaster, which most international media coverage focusing on the regime’s poor human rights record. The Azerbaijani regime took great pride in the event, and it is not an understatement to say that the European Games took over the entire country for many months—including road closures, mandatory “volunteer” work by students, mandatory rescheduling of work days, and schools and universities closing over a month early. Importantly, any criticism of the Games was not tolerated. International media were instructed that they would lose accreditation for “working against Azerbaijan’s territorial integrity, independence, interests and sovereignty” and “will face the full force of the law” for “spreading distorted information on Azerbaijan, thus unfairly representing the country’s interests.” And many journalists were in fact denied entry and deported. Pro-regime social media users monitored online discussion of the Games and swiftly attacked domestic and international criticism. One Azerbaijani journalist even received a death threat due to his critical coverage of the Games. Given this, these memes criticizing the European Games are not just fun. These memes were viewed as direct attacks upon the regime and could carry severe consequences for creators or distributors. (I myself collected some of the memes and put them on my blog and was promptly slandered in pro-regime online newspapers.) Given past swift and severe punishment of memetic dissent in Azerbaijan, Yet they were still created and distributed, despite likely consequences. I speculate that the opportunity to disparage the regime, leveraging the sharedness of memes, was far too powerful and tempting to not create and distribute them. The gazelle character presents a dish that is often a source of debate between Azerbaijanis and citizens of neighboring countries as to its origin, thus this is an inside joke for those aware of this debate and the absurdity of fighting about food. This meme also connects the absurdity of national pride and ownership over a dish with the pride of the European Games. 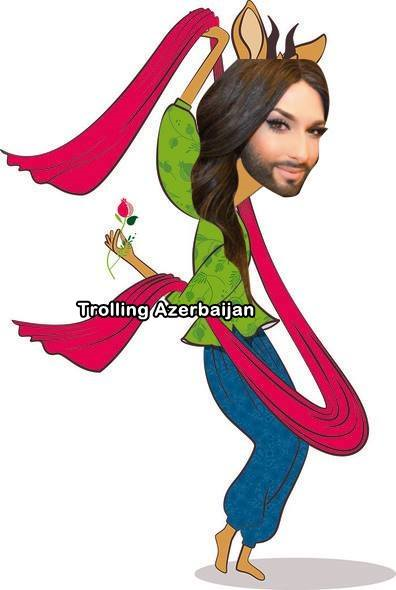 In this meme the gazelle has the head of 2014 Eurovision winner Conchita, popularly disliked in Azerbaijan for being a drag queen. This meme is an inside joke about the conservativism of Azerbaijan, differentiating meme creators and consumers as more progressively minded than the average Azerbaijani. Moreover, there was online discussion of the gazelle character’s gender. 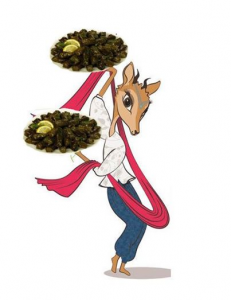 The gazelle is clearly dressed in feminine clothing nodding to traditional Azerbaijani female national costume, yet the gazelle also had horns –which is an attribute of male gazelles. Using Conchita draws attention to the discussion of the gazelle character’s gender and a mistake made by the European Games team. 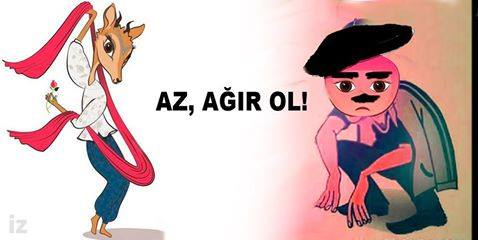 In this meme, the pomegranate tells the gazelle “Woman, behave yourself!,” playing on traditional Azerbaijani attitudes toward women, again, differentiating the meme creators and consumers from traditional Azerbaijanis. An opposition member was “kidnapped” (when an individual suddenly has no contact with his family for many days, usually assumed to have been detained by the authorities) earlier in the week that the mascots were launched. This meme shows the gazelle and pomegranate as police detaining him. This is a direct joke toward the regime on its action of kidnapping a critical individual and directly links the European Games with the regime’s bad behavior. “Shove him in the car” is the caption. The photo used in the meme was taken from an earlier detainment of this individual. A detained opposition youth’s face is on the pomegranate’s tee-shirt, part of a series of these featuring many detained opposition youth. This is an act of solidarity with detained oppositionists and a direct critique of the Games and regime. 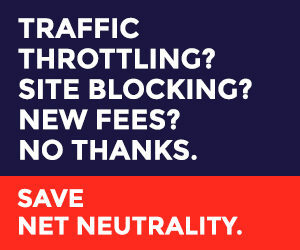 Memes can be powerful. In this particular case where one group has few resources, the low cost, speed, anonymity, and importantly, unpredictable variation and sharedness inside-joke quality of memes allows for a golden opportunity to disparage an authoritarian regime. Yet no one should expect a meme-fueled revolution in Azerbaijan. 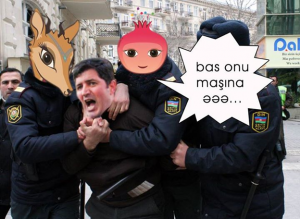 As I’ve noted elsewhere, the Azerbaijani regime swiftly and severely punishes online memetic dissent. Perhaps that the regime views them as so threatening (note that some regimes even ban memes) is the strongest argument for the power of such memes. It is possible that exposure to multiple forms of memetic dissent over time may have some sort of impact – planting a critical seed in a young mind, perhaps. And importantly, the production and consumption of memetic disparaging dissent may in fact create and support the kind of group identity described earlier in this piece. It an individual creator or consumer does not feel alone. The above is part 7 of 8 in a collection on internet memes and viral media compiled for Culture Digitally, based on a pair of panels at the 2014 and 2015 meetings of the International Communication Association. We’ve taken to calling it “The Culture Digitally Festival of Memeology” and will release two entries a week for the next month. We hope you enjoy the show.